Tony Manzelli started lacrosse at Weymouth North High in 1971 and in only a few short years turned Weymouth into a Massachusetts lacrosse perennial powerhouse. Coach Manzelli has won numerous Division 1 Coach of the Year Awards, holds the Massachusetts record for wins in a career for lacrosse coaches with 400+, has coaches over 25 High School All Americans, won 20+ league championships and was inducted to the New England Lacrosse Hall of Fame. The Town, families, and athletes of Weymouth have been very fortunate to have Tony give so much to the kids in this community. Each year, his former players (many who have been inspired by Coach Manzelli and have joined the coaching ranks in various high schools and colleges) come back and go over all the great victories and wonderful moments they shared in the Weymouth Lacrosse Family. Thank You Coach Manzelli - words could never express how much you have been a true inspiration in our lives. 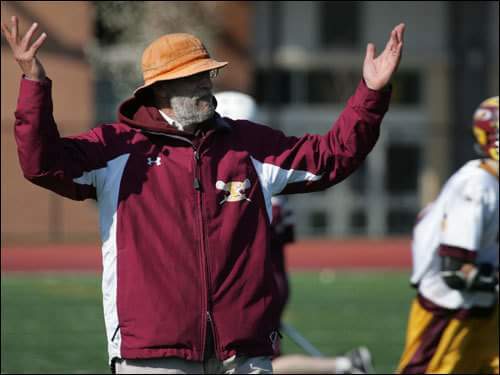 Legendary Weymouth High School coach Tony Manzelli, considered the founding father of lacrosse in Eastern Massachusetts, passed away Feb. 4 after suffering through a short battle with lung cancer. He was 58. Manzelli, famous for his orange bucket style hat he wore for most of his career and a red stick he played with at Boston State College, was instrumental in bringing lacrosse to the area south of Boston. He retired in 2006 after an illustrious 32-year coaching career which included 15 league titles and a state championship in 1986. He coached more than 20 All-Americans, numerous college players and was inducted into the National Lacrosse and New England Lacrosse Halls of Fame in 1998. Manzelli didn’t pick up a stick until he was in college, where he was more of a bruiser than a finesse player, displaying a diligent work ethic at an early age. He grew up in Somverville, Mass. and went to Boston State because it was what he could afford. In 1971 there were just 18 high schools with lacrosse in the state, and because of Manzelli’s teachings and devotion to giving free clinics and lessons over time, he was able to spread the sport into what it is today in the area. There are more than 130 schools with lacrosse now in Massachusetts. He would often recruit players for his team by picking them out of the hallway randomly and telling them to play. He felt anyone could play the sport and lived by two simple rules when coaching: everyone has fun and everyone plays. “If he didn’t come here, lacrosse would have never been what it is today,” says Danny Chouinard, who played for Manzelli from 1988-1991 and has coached with him for the last nine years. Chouinard is one of many former players to learn a great deal about life and take away a slew of powerful memories associated with Manzelli. When Chouinard’s mother passed away from breast cancer his junior year, Manzelli had the team wear commemorative patches on their jerseys the entire season and was there to support him every second he needed it. While he was there for you emotionally, he was also there to tell you if you did something wrong and reprimand you at the same time. Even opposing players had good relationships with Manzelli. Sean Morris, who plays for the Chicago Machine of the MLL and played at nearby Marshfield High School, was coached by Manzelli in the Bay State Games and was often told by him that he was a Weymouth kid living in a different zip code. “He’d make the weakest kid feel good and make you proud to wear the maroon and gold jersey,” said Joe Donovan, a member of Manzelli’s team from 1989-1993. And where does the colorful spirit come from? It was simple. The orange hat he just put on because he was headed to practice and needed something to wear. It just stuck because the players liked it. He painted his stick red because no one else had color on their sticks and he wanted to be different. Manzelli learned about his condition shortly after his retirement in May 2006. Friends said smoking was the only thing he regretted in life and that he would rather go quickly than suffer. But through his former players, Manzelli’s work will live on in every lacrosse player in Massachusetts. The late Weymouth High School lacrosse coach Tony Manzelli patrols the sideline in April 2004. My family and I visited a legend this past Christmas for the last time. I drove down to Kingston with my brother Joe, my Dad and my two sons. I wanted my sons to meet the person who along with my family had developed all the good parts of the person I am. I also wanted them to meet one of the great legendary characters of high school lacrosse, Tony Manzelli, who coached Weymouth for 32 years. He was bedded down in his recliner inflicted with cancer but in great spirits. He made you proud to be from Weymouth. It made me extremely proud that vocational school kids let me play alongside them; we were tough, hardworking and committed, like Manzelli taught us. And unlike Robin Hood, he stole from the ‘‘poor’’ and gave to the ‘‘rich,’’ helping first Hingham, then Wellesley, and then other more affluent towns in eastern Massachusetts develop their high school teams and programs. It reminded me of how my family and I first started to get to know him. He drove a tiny midnight blue Datsun, with over 120,000 miles on it. He would drive by me each day as I walked home from practice. Once after a particularly painful loss he stopped and offered me a ride. Somehow he agreed to drop me off at home, so I took him down our dirt road. My mom offered him to come inside. The coffee my mom offered him was awful, which he promptly told her but drank it all. And we talked for hours. He did things like this with everyone, particularly with those kids in need. For more than two generations of Weymouth high school students, he always had time. This is the thing he taught me, taking time and being there. Just being there for kids, no one could ever match this ability but we should all try. As he progressed in his last few months he used to change in the den beside his chair as my sons found out in a way only Manzelli could pull off. He said each day he now takes his time choosing which boxers to change into. And they soon saw what he meant, as he showed us that he used the lacrosse shorts that all his players had given him as boxers now. And on this Christmas eve morning, he began to go through his choices. He came to a pair maroon in color, with gold stripes. He sat back in his chair and held them up and I knew he was choosing these for Joe and me. Particularly me, so my sons could see it didn’t matter what fancy school you went to for college or team you played for later, but it matters where you were from and what you stood for. This was all the more meaningful because my dad, an ex-Weymouth football player himself, was there to see that he chose the shorts that said Weymouth. Even in his last month in his own funny way he made me feel special I was from Weymouth, and also sent me a message to never forget it either. Maroon and Gold Forever, Forever and a Day. Pure and funny and so unadulterated and direct. It took till spring of my high school senior year to realize, just partly, who the man coaching me truly was, and I realized it by chance in my cellar, bench pressing. As I looked up I saw a faded picture from a Patriot Ledger newspaper draped over a hanger and realized it was a picture of a guy in an orange funny bucket beach hat and beard. I pulled the hanger down, and read a 1978, four-year-old article about a coach whose team was maybe going to make the playoffs for the first time. But the most amazing thing was that six years earlier he gave up his final year of Boston State college lacrosse eligibility to start this high school program. It was then I began to realize what a wonderful, remarkable person he was and his family was for sharing him. I didn’t know that 20 years ago, in fact I didn’t fully realize it till just then. I have a lot of catching up to do and never will, but the important thing he taught me was to never stop trying. It amazes me now, how strong and energetic he was for us, letting us forget he was sick, until I hugged him too tight in the driveway and he winced and hollered at me like he used to and then he suddenly stopped, telling me it was fine, but we looked at each other and knew. According to Manzelli, ultimately it was never about who won and lost on the scoreboard, but rather who wins and loses in their hearts, about those who never stop trying to be their best for the world, like him. And so Tony managed to pass along his very being to a new generation. John Q. Donovan of Unionville, Pa., a former East Weymouth resident, works as an operations business director for E.I. DuPont.